When someone enters your home, you may not think that they will notice your lighting. However, there is more value to lights than you may think. They are affordable and trendy, and they can raise the quality of your home. That is why Crescent Harbor Modern offers stylish and contemporary light fixtures. We offer the latest trends in modern lighting fixtures, European lighting fixtures, or even transitional lighting fixtures. We have what it takes to showcase your personal style in order to make your home more desirable. We have lots of sizes and shapes to choose from, and chandeliers are one of them. 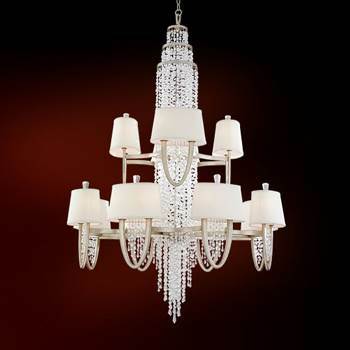 We offer your classic style chandeliers, and even smaller, and modern chandeliers. If you’re looking to illuminate a small space, a small chandelier will be a good way to light up the room. For example, our George Kovacs 3-light mini chandelier in Brushed Nickel finish will work well above an island in the kitchen, or even in a small living room. Its white bulbs will work with a pastel or white wall, and will bring life to any room. If you’re looking for something slightly larger, try our George Kovacs 5-light chandelier in Polished Nickel finish. It is elegant, and it is fit for a dining room or living room setting. . The “George Kovacs” version is a light voltage chandelier in brushed nickel. It has two sets of dangling bulbs, and one hangs lower than the first, which will give a hint of elegance to any dining room. The low voltage will provide a certain mood regardless of who you’re entertaining. If you’re looking for something that adds an edge to your foyer or hallway, then a large chandelier would work like an 8-light chandelier by Corbett Lighting. On the other hand, for something that will really grab the attention of people entering your home, grand and custom chandeliers will be the best choice. Why should you get more lighting? Lighting is a good way to maintain the value of your home, especially with the uncertainty of the market. According to How Stuff Works, space and lighting plays an important part in the value of your home. Dark rooms or hallways are not desirable in a home, so adding light will give it life and make your home more appealing. Adding more space is also a good way to add value to your home. We can help you achieve this. Additionally, we have modern lights to go with any modern bathroom. We have a variety of shapes and styles, just like our other lighting. For example, George Kovacs’ 1-light wall sconce is a good way to separate a mirror or medicine cabinet. It will light up any room as well as add a trendy look to your bathroom while you wash up in style. We have a variety of two light sconces as well. Let us be your source for improving your home, and keep it hot on the market for years to come. Feel free to contact us on our website, email us at customerservice@crescentharbormodern.com or call us today at 1-888-355-9525 with any questions you may have.